7 replicas of the front half of Schöningen spear II will be crafted from naturally grown spruce to match detailed measurements taken from published scaled photographs (whole spears cannot be used in this particular case because the barrel of the air cannon is 1 meter in length). Mass will be added to the rear of spears to replicate the total mass of previous complete replicas, thus replicating the kinetic energy. The air cannon is capable of firing at hand-throwing impact velocities, making it an excellent choice. The target is a mammal torso designated for human consumption. It will include the hide, is ethically sourced from a local butcher, and complies with testing protocols at the testing facilities. Each impact will be filmed with high speed video to directly relate impacts with velocities and ensure that velocities are accurately replicating hand-thrown spears. Spear points will be moulded using HighFlex silicone to capture surface marks and morphology, and faciliate the making of resin casts for further impact testing. Impact velocities will be analysed using Phantom Cine View software. Wounds will be analysed by measuring Depth of Penetration of the spear points and photographing external wounds. Spears will be fired repeatedly until damaged beyond repair to maximise sample size. Spears will be resharpened if lightly blunted, with each resharpening being documented with photographs and Hiflex silicone moulding putty. Resin casts from the moulds will be compared in an impact drop test to analyse for homogeneity of variance. 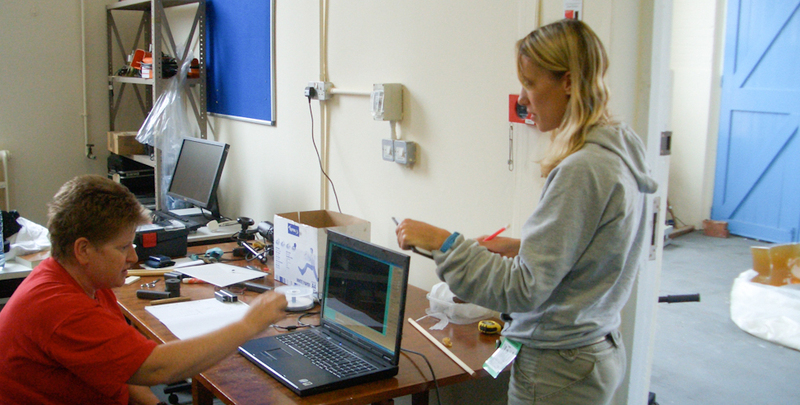 Bones will be cleaned and resulting lesions will be analysed using an image processing programme such as ImageJ. Lesion characteristics will be studied both with the naked eye and microscopy, and compared with previous results from experimental work using replicas as thrusting spears, and using hammerstones on flat bones. 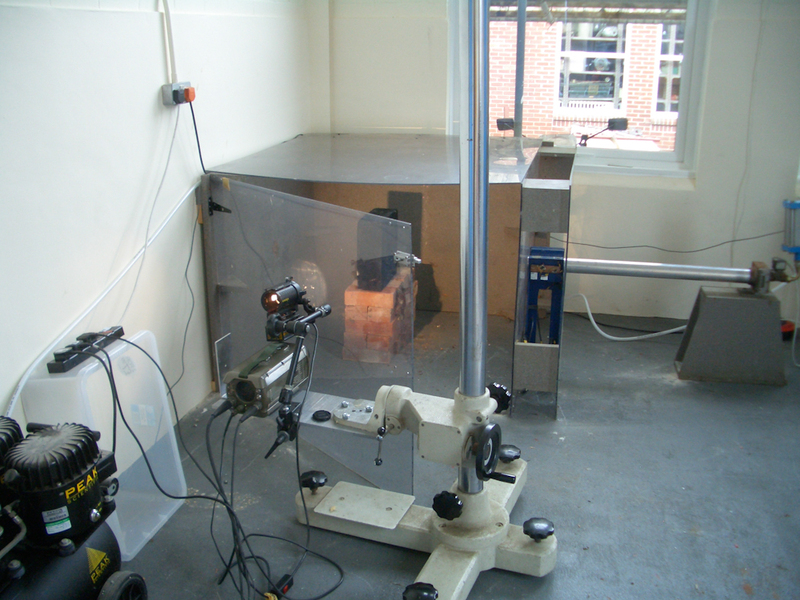 Our experimental setup, showing the air cannon and high speed video camera. Challenges are likely to be similar to previous experiments. The experimental setup has been previously tested, but the air cannon needs a bit of pre-experimentation to set the pressure bar correctly. Occasionally the high speed video does not fire and therefore does not capture the impact, but again pre-testing should eliminate most of these errors. Sample sizes are relatively small, but the experiment is designed to maximise the materials available. Previous impact testing on resharpened spear points has demonstrated that resharpening of wooden spear points has little effect on effectiveness and resin casts of the points will be tested to understand any variance from resharpening points. The experiment tests the research question of the whether wooden spears, fired at hand-delivered velocities, are capable of lethally wounding a large mammal such as a horse. The secondary question, of what the resulting hunting lesions might look like is also key in that it enables an empirical assessment of rare artefacts such as the Boxgrove horse scapula fragment bearing a potential hunting lesion. A better understanding of hunting lesions from wooden spears will inform zooarchaeological studies of sites like Boxgrove and Schöningen. The data will be analysed using multiple methods, including use of traditional analytical methods, the use software, microscopic techniques, and statistical analysis. The results will help to formulate new hypotheses and experimentation on the use of early weaponry in human evolution. Replication of the experiment will be straightforward.